Not only has Test Kitchen made me try cooking with new ingredients, it has also pushed me out of my comfort zone with cooking methods. 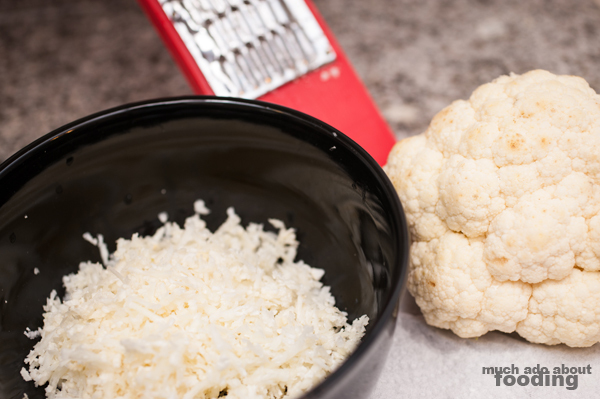 When cauliflower popped up as a test ingredient, I was so grateful to see many of you chiming in with suggestions! My thanks to Suki, Austin, Lori, and Shivanand for commenting with fantastic recipe ideas. 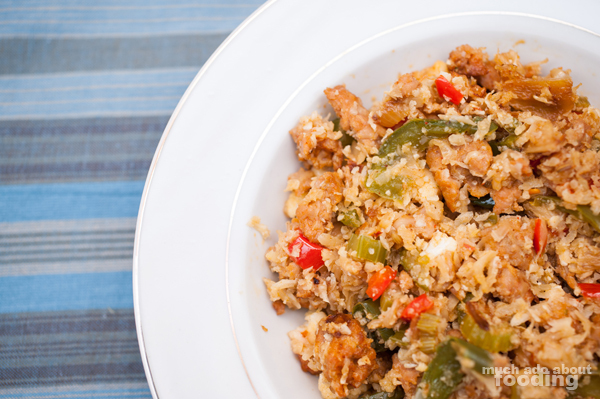 I decided to take a little bit of each concept to put together this dish of cauliflower dirty rice (meaty idea from Suki, simplicity from Austin, rice substitute from Lori, and spiciness from Shivanand). 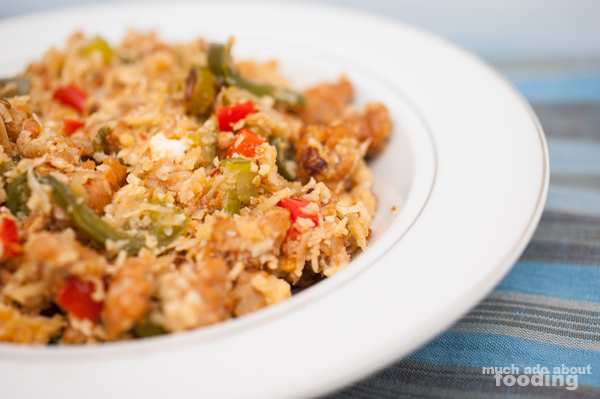 Traditional dirty rice is created by cooking with chicken livers/gizzards but Duc and I wanted to stay lean so used chicken sausage. Check out this spicy dish! As you can see, there is plenty of prep work for this dish. Chop onions and set aside. Into another bowl, add sliced green bell pepper, diced red bell pepper, and sliced celery. Start a large skillet with olive oil on medium-high heat. Slice garlic and set aside. For cauliflower, remove all leaves. To rice, either use whole head against a grater or pulse in a food processor until the consistency/texture of rice. 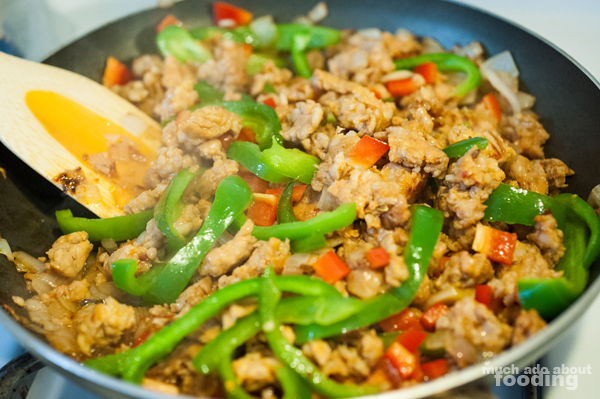 To skillet, add chopped onions until just before translucency. Add in garlic. Using your hands, squeeze out sausage from encasing and break up meat into little pieces with your spatula. Stir until chicken nearly cooked through. Add in peppers and celery. 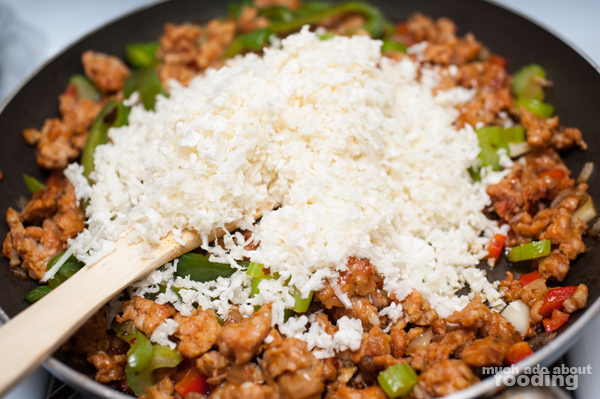 Once peppers and celery have softened, add in cauliflower rice and stir thoroughly to get sausage oils and juices to coat the rice, making it "dirty." Add chili powder and mix well. Take off heat and enjoy! 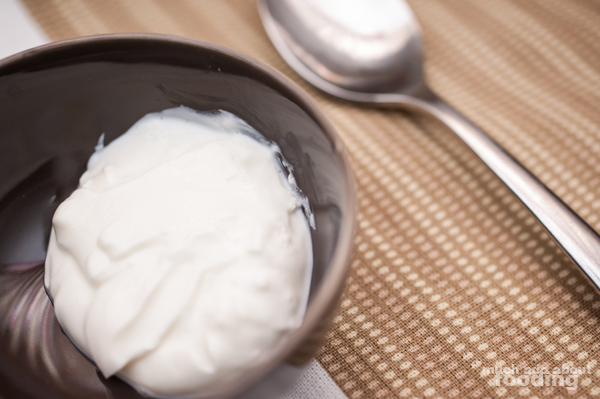 "Strained yoghurt, yoghurt cheese, labneh, or Greek yoghurt is yoghurt which has been strained in a cloth or paper bag or filter to remove the whey, giving a consistency between that of yoghurt and cheese, while preserving yoghurt's distinctive sour taste. Like many yoghurts, strained yoghurt is often made from milk which has been enriched by boiling off some of the water content, or by adding extra butterfat and powdered milk. However most strained Greek yogurts have no added fats and are made of real milk. What do you think I should do with Greek yoghurt this week? Comment on Facebook!